There is just no doubt that using a family calendar can really improve your life and if you are willing to dedicate yourself to faithfully maintaining all of your appointments and family commitments in one place, you will always know where to go to be prepared for the day, week, and month ahead. But to do this, you have to have the right tool for the job and use a great family calendar that will help you to get organized and stay organized throughout 2019! 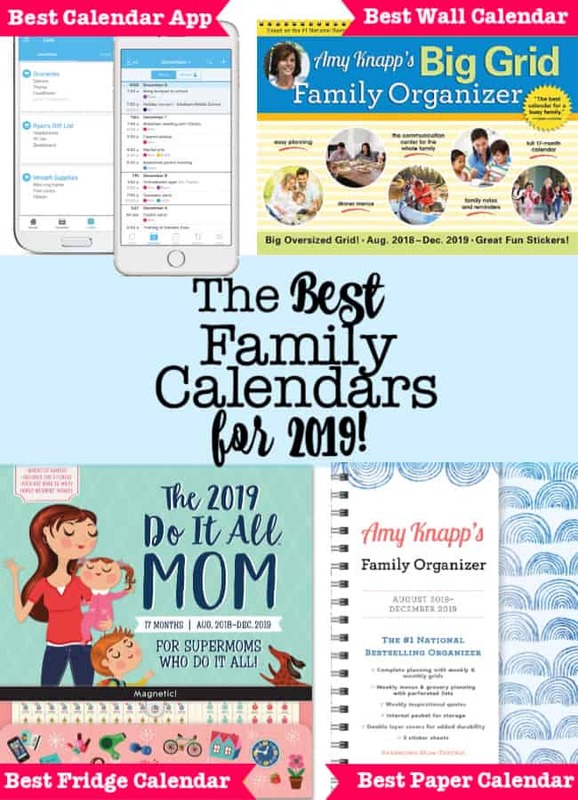 Our Top Picks for the Best Family Calendars for 2019! What Type of Family Calendar Will Work Best for You? What is the Best Family Calendar App? 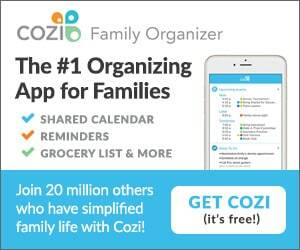 Cozi Family Organizer This is an affiliate link: MomOf6 earns a commission if you purchase, at no additional cost to you. 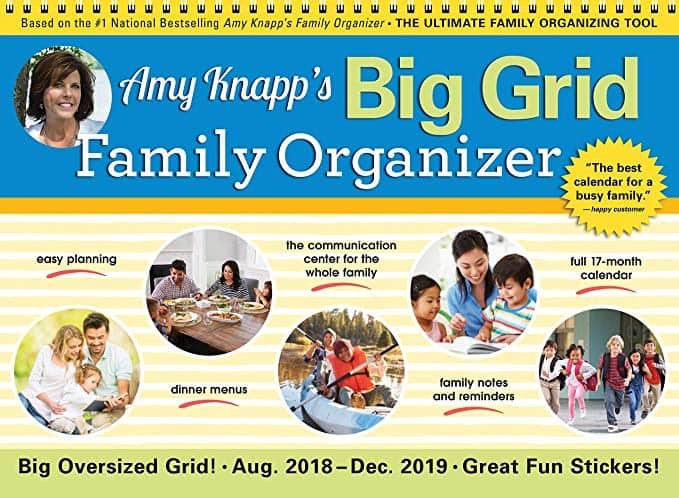 Amy Knapp Big Grid Family Organizer This is an affiliate link: MomOf6 earns a commission if you purchase, at no additional cost to you. 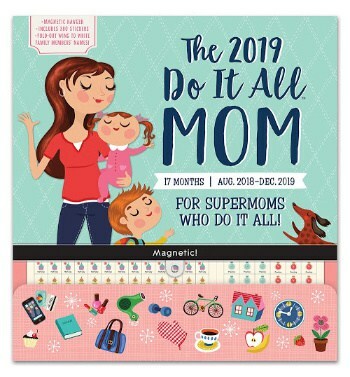 Do It All Moms Magnetic Fridge Calendar This is an affiliate link: MomOf6 earns a commission if you purchase, at no additional cost to you. Amy Knapp Family Organizer This is an affiliate link: MomOf6 earns a commission if you purchase, at no additional cost to you. Fineline Pens This is an affiliate link: MomOf6 earns a commission if you purchase, at no additional cost to you. 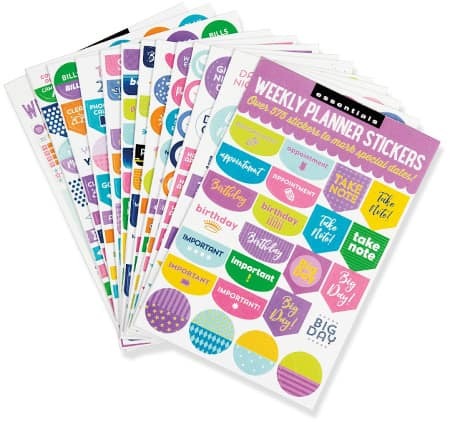 Essentials weekly planning stickers This is an affiliate link: MomOf6 earns a commission if you purchase, at no additional cost to you. Finding the best family calendar that works for your family can be tough! 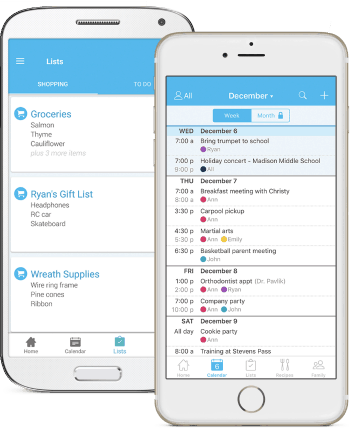 There are all kinds of family calendars available to you- shared calendar apps that allow you to sync to your spouse's work calendar and your kids' sports calendars. There are calendars that you can hang on a wall and everyone in the family can see each morning. 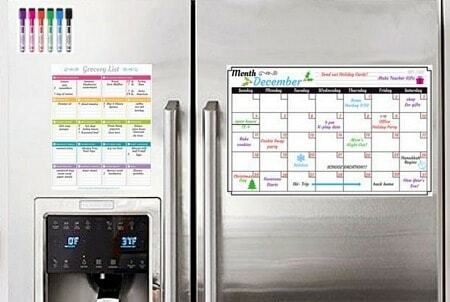 There are calendars you can mount on your fridge and ones that work with dry-erase markers so you can clean them off and start new each month. And there are paper calendars that you can toss into your handbag and take along to all of your appointments. But what it comes right down to is- which type of calendar are you most likely to use consistently? Because if you don't use it to record all of your appointments and commitments- then it's not going to be very useful to you! 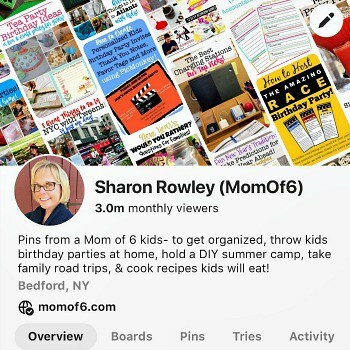 If you aren't currently using an electronic family calendar that you access on your phone or tablet, then Cozi This is an affiliate link: MomOf6 earns a commission if you purchase, at no additional cost to you. should be the very first system that you try. It is all accessible from an app on your phone as well as on your other devices- and every family member can access your calendar through the app as well. Cozi Family Organizer Specially designed as a calendar app for families, Cozi features the ability to keep multiple calendars (color-coded by family member), allows you to make to-do lists and grocery lists, menu plan, and provides several options for printing calendars. You can set reminders and email notes for upcoming appts. You can share your to-do lists with your family too. Can easily set up recurring events. Syncs with other e-calendars and apps. Easily create to-do lists and share them with family members. This is the best place to get started if you are ready to switch to an electronic calendar system! 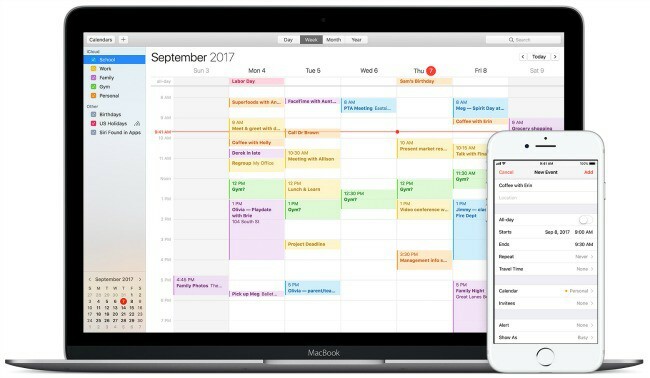 Apple Calendar It allows for multiple color-coded calendars. You can set up separate calendars set up for family appts, to-do lists, and business calendars. You can also subscribe to public digital calendars (such as the kids' schools). It syncs to iCloud so all of your devices are in sync, and it "plays well" with Google Calendar making it easy to update family members. 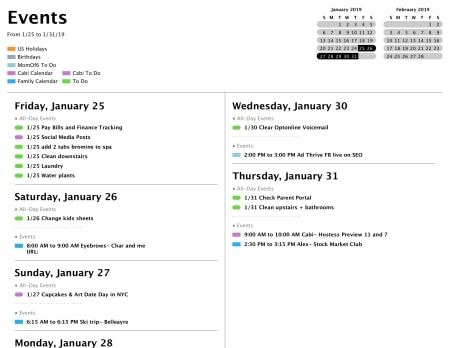 One of the things that I think sets Apple Calendar apart from other electronic family calendars is the ability to print out your calendar multiple ways! I can print out a monthly view of just our family calendar and family to-dos and post it in my kitchen command center. I can print my weekly view as a list which I place on a clipboard and work from each week. Note: Not an Apple user? The only way to access an Apple Calendar is with an Apple ID- making it rather inaccessible if you aren't using an Apple device of some kind. Windows has a similar calendar system (Microsoft Outlook) that works on Windows desktops/laptops and syncs nicely with Windows phones and tablets. It also syncs well with Google Calendar. But Outlook and Apple Calendar don't play well in the same sandbox- so be aware that it is not always easy to get them to sync with one another. 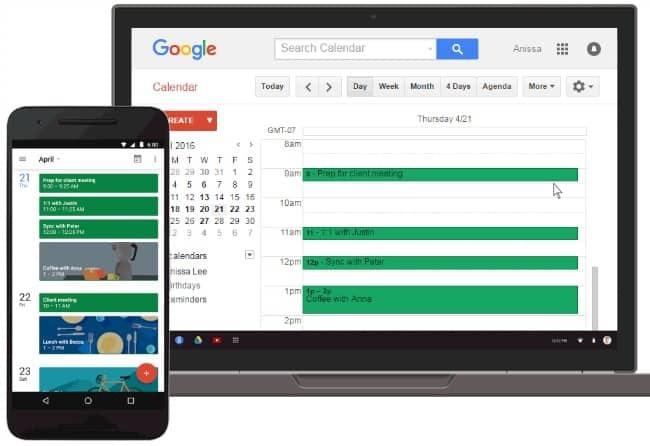 Google Calendar is probably one of the most widely used shared calendar apps because most people are quite familiar with Google. It is free with your Google account and already handily displays on the menu bar if you are using Gmail. In spite of the fact that I believe very strongly is using electronic calendars to manage your family life, I know that many of you prefer a calendar that hangs on a wall for everyone in the home to see! Here are the best wall family calendars for 2019! 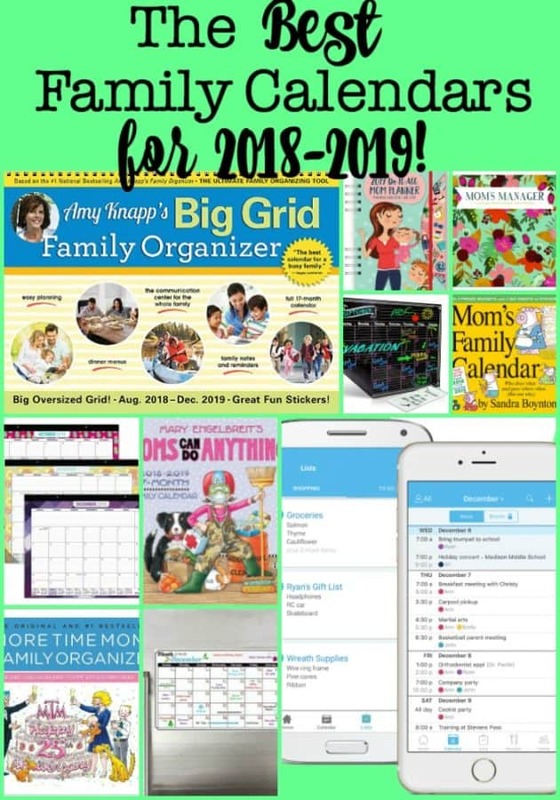 If you are a die-hard wall calendar person because you need to see everything posted in one place where the entire family can gaze at it over breakfast- then check out the Amy Knapp's Big Grid Family Organizer This is an affiliate link: MomOf6 earns a commission if you purchase, at no additional cost to you. . This calendar continues to be a favorite with MomOf6 readers year after year! Amy Knapp Big Grid Family Organizer With plenty of space on every date to fill in appointments, this calendar provides room for menu planning, and comes with a Monthly Projects section with such gems as "Talk to your kids about their Halloween costume" (in Aug! ), and "Check in on your resolutions" (in Feb!). There are lots of color-coded stickers you can use for special events and birthdays! Includes chore charts and meal planning charts. This calendar is packed with good ideas that a family can use! Mom's Family Calendar The nice thing about this calendar, aside from the adorable bears, pigs, and hippos, is that the monthly calendar view has the days of the week going down the side of the page, and then there are five columns going across the top (one for each family member)- so you can easily see everyone's commitments for the day! It also comes with tons of stickers! The Mom's Family Calendar is also available as a desk calendar This is an affiliate link: MomOf6 earns a commission if you purchase, at no additional cost to you. 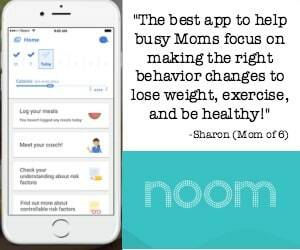 for Moms on the go! 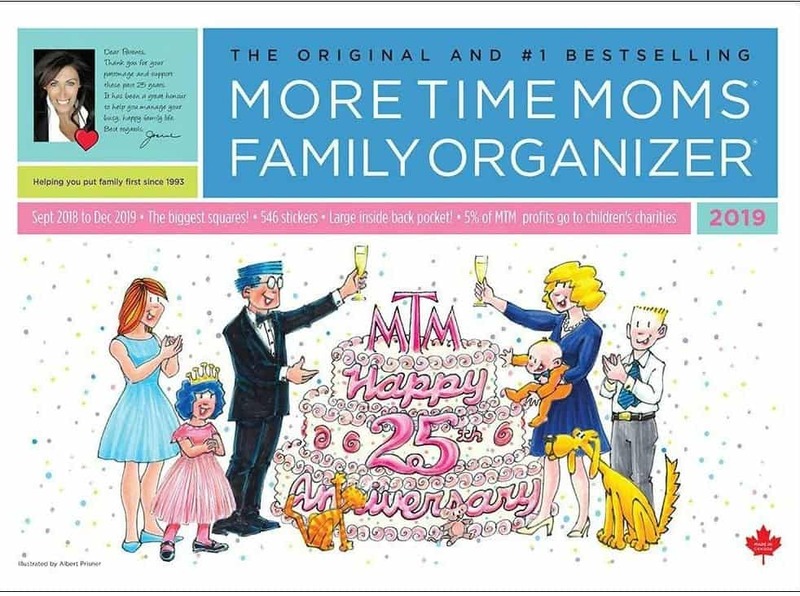 More Time Moms Wall Calendar What Moms love best about this calendar is that the format follows a traditional calendar layout and has date boxes that are large- with nine lines!- so you write in all of the details you need to manage your family's busy schedule. The calendar comes with stickers so you can use it as a chore chart as well as a family calendar. 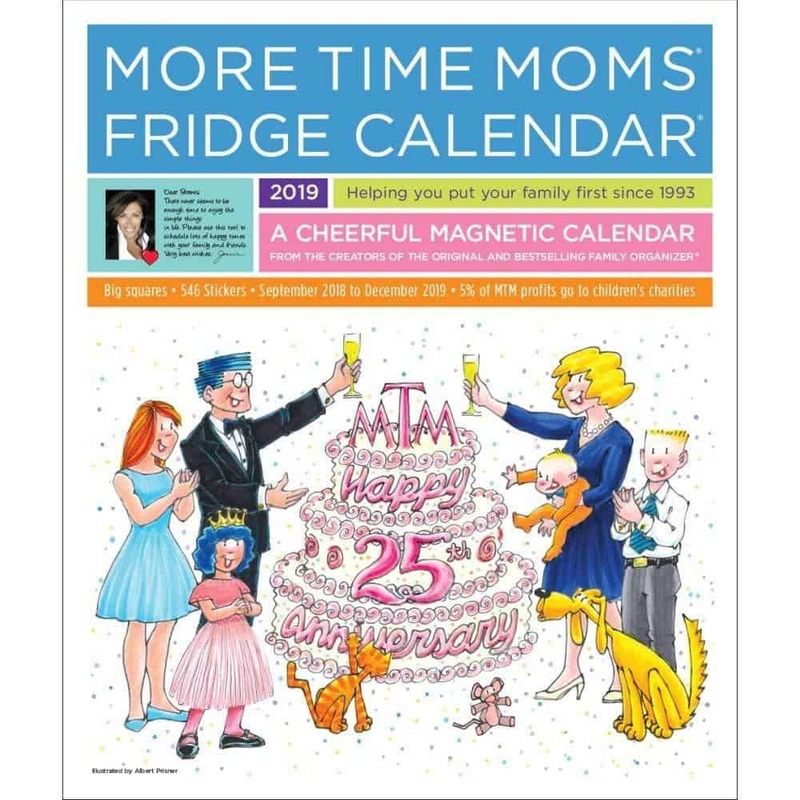 More Time Moms is also available as a fridge calendar This is an affiliate link: MomOf6 earns a commission if you purchase, at no additional cost to you. if that fits your space better! Mom's Manager Wall Calendar One of the things that makes this wall calendar different from others- is that each line on the calendar is intended to be for one person, and you can write in everyone's name just once and then use that list month after month (because re-writing labels can be a pain!). It features a pretty floral design that should brighten your home and lots of stickers! 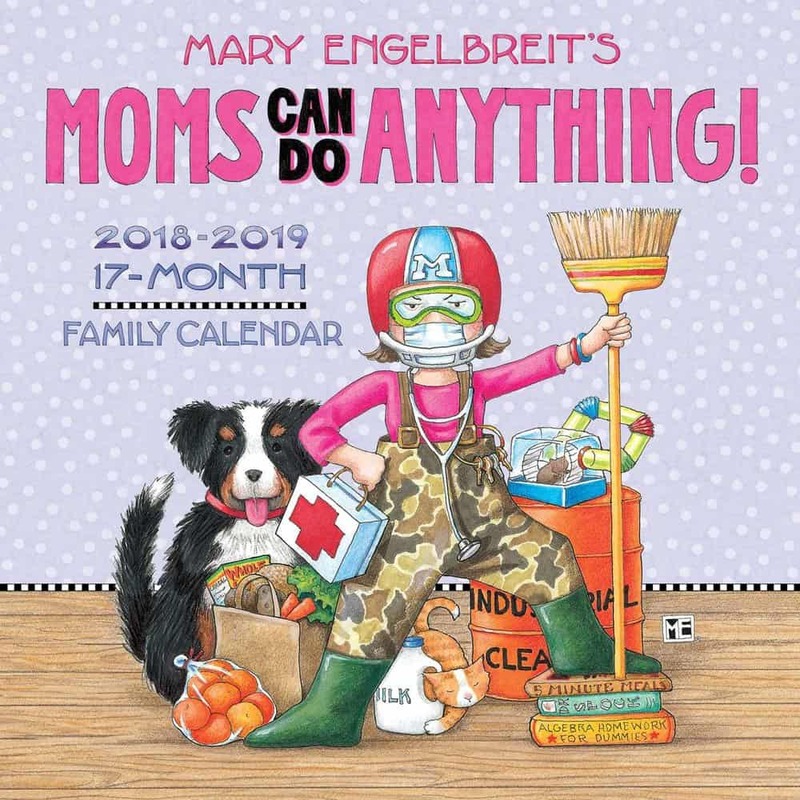 Moms Can Do Anything Wall Calendar Featuring Mom-inspired artwork by Mary Engelbreit, as well as heartwarming quotes on every page, this calendar features 5 lines for each date so that you can keep track of all of your busy family's appointments. There's plenty of space to make notes and a pocket that can hold flyers, invitations, coupons, and more. 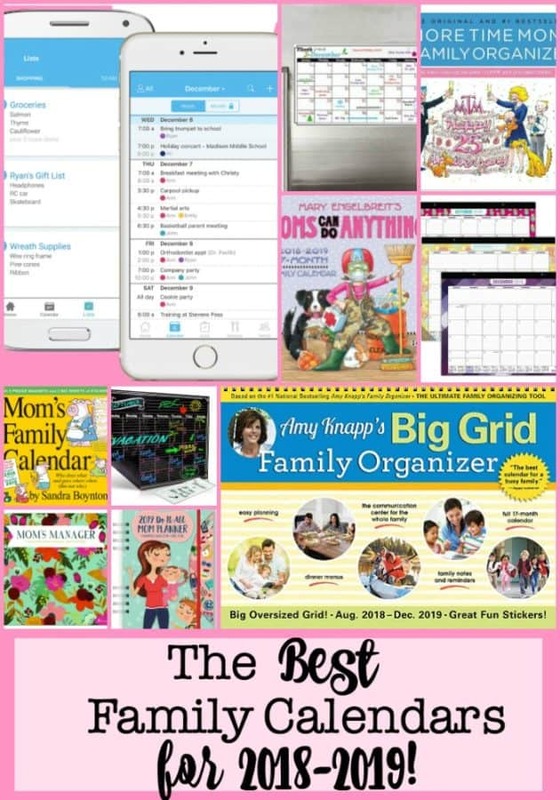 Amy Knapp's Big Grid Family Organizer This is an affiliate link: MomOf6 earns a commission if you purchase, at no additional cost to you. Mom's Family Calendar This is an affiliate link: MomOf6 earns a commission if you purchase, at no additional cost to you. 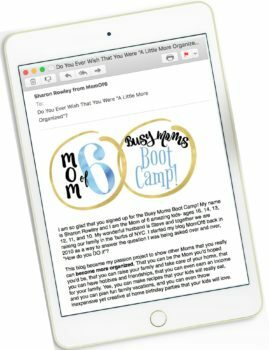 More Time Moms Calendar This is an affiliate link: MomOf6 earns a commission if you purchase, at no additional cost to you. 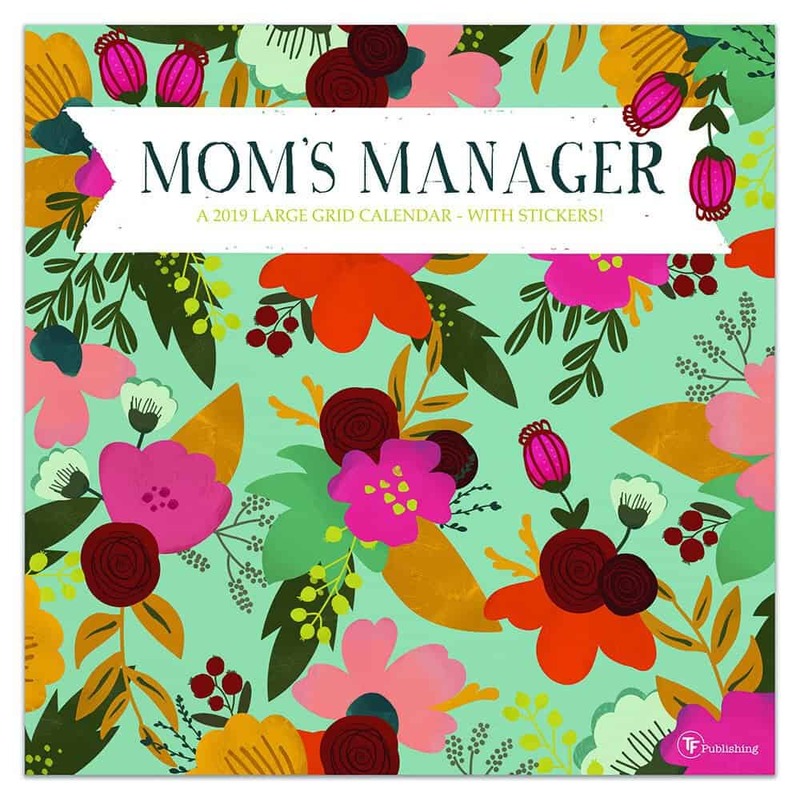 Mom's Manager Wall Calendar This is an affiliate link: MomOf6 earns a commission if you purchase, at no additional cost to you. Moms Can Do Anything Wall Calendar This is an affiliate link: MomOf6 earns a commission if you purchase, at no additional cost to you. Size when hanging 22"x15" 24"x12" 22'x15" 24"x12" 24"x12"
If you don't have a lot of wall space in your kitchen, but love the idea of posting your calendar in one place where the entire family can see it and contribute to it- try a fridge-mounted calendar instead! Do It All Moms Magnetic Fridge Calendar The Do It All calendar has extra-large grids with plenty of room to write. A handy large pocket stores notes, coupons, and receipts and there are 300+ stickers to mark appointments, birthdays, trips etc. Its magnetic hanger with a unique holder allows the calendar to be used on the fridge or on the wall. More Time Moms Fridge Calendar This colorful family calendar has large unlined spaces for each day with lots of room to write. There's a section each month to define family plans, chores, and goals- and it comes with hundreds of stickers to serve as reminders and rewards. 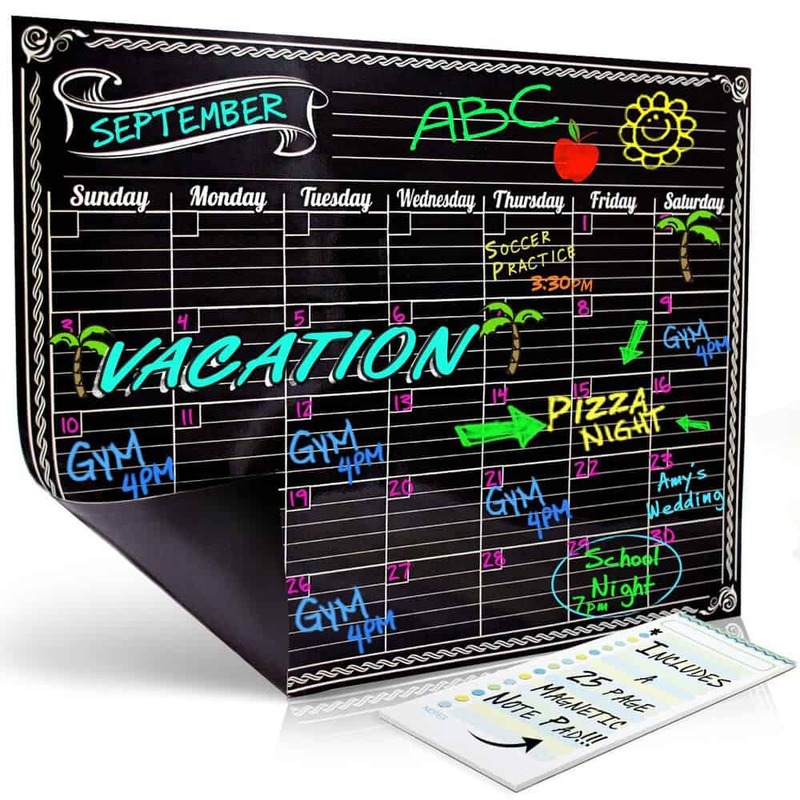 Magnetic Dry Erase Calendar If you keep your calendar in an agenda book but want to be able to display a monthly view of that calendar on your refrigerator door for the entire family to see- then this magnetic dry erase calendar is a great solution for you. A bit "old-school"- as you will spend time re-writing things that you've already written elsewhere! But it might be your thing! Chalkboard style monthly calendar This chalkboard style monthly calendar is another nice option to hang on your fridge. And if you prefer a weekly format vs. a monthly one- you can opt for this chalkboard style weekly calendar This is an affiliate link: MomOf6 earns a commission if you purchase, at no additional cost to you. instead. 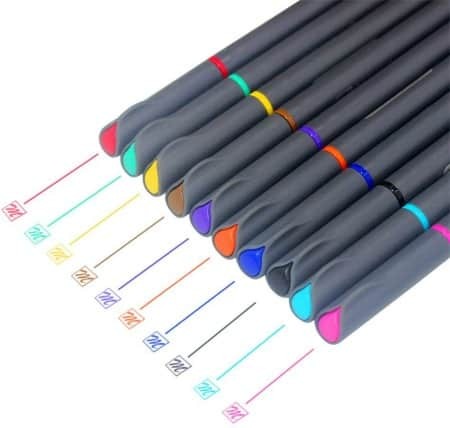 Be sure to pick up a pack of liquid chalk markers This is an affiliate link: MomOf6 earns a commission if you purchase, at no additional cost to you. to use on these calendars! Do It All Moms Fridge Calendar This is an affiliate link: MomOf6 earns a commission if you purchase, at no additional cost to you. More Time Moms Fridge Calendar This is an affiliate link: MomOf6 earns a commission if you purchase, at no additional cost to you. Dry Erase Fridge Calendar This is an affiliate link: MomOf6 earns a commission if you purchase, at no additional cost to you. Chalkboard Style Calendar This is an affiliate link: MomOf6 earns a commission if you purchase, at no additional cost to you. 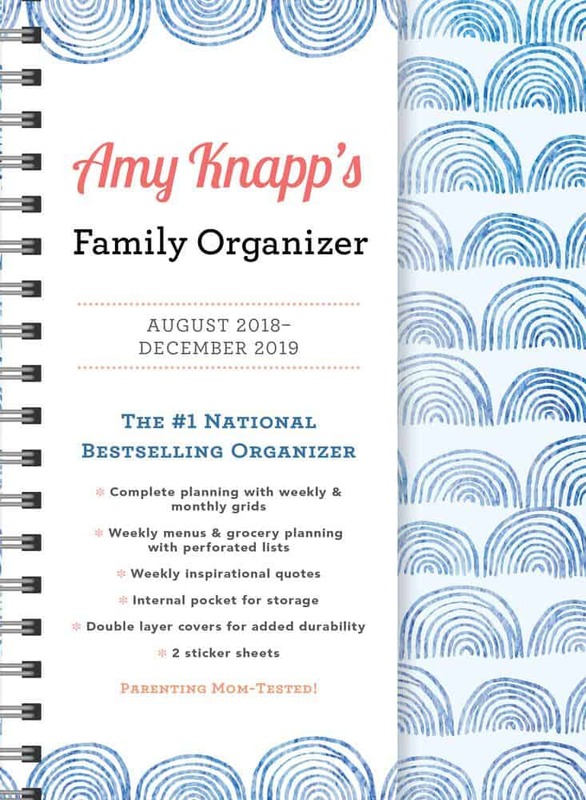 Size when hanging 12"x12" 13"x16" 17"x13" 12"x16"
Amy Knapp Family Organizer The 2019 organizer features weekly and monthly calendar grids, weekly grocery lists, weekly to-do lists and inspirational quotes, and color-coded stickers in a portable spiral-bound notebook. Includes space for grocery lists and menu planning. 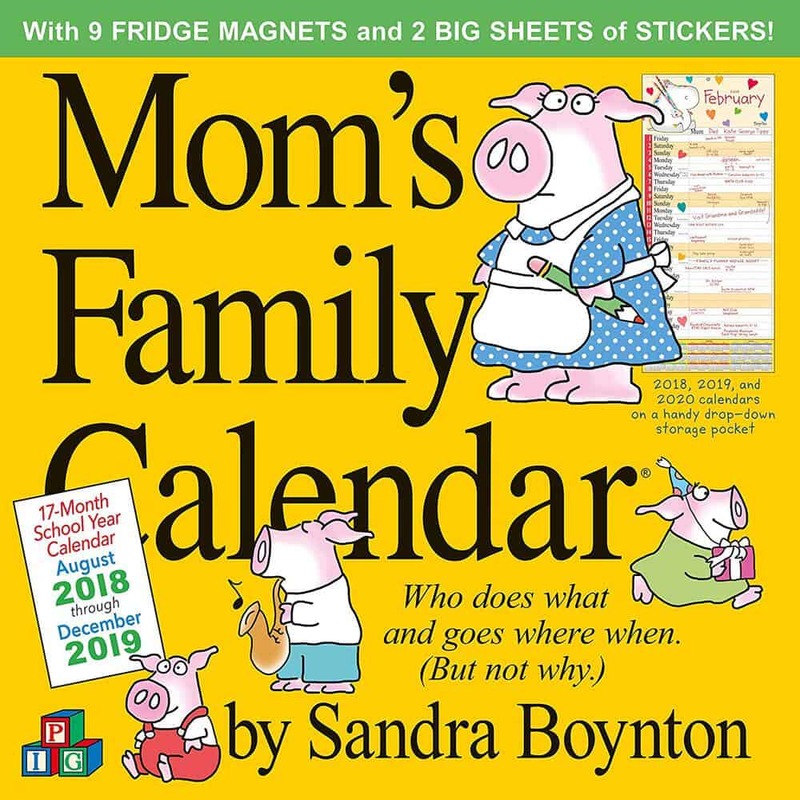 This fantastic desk calendar is also available a Christian Family Organizer This is an affiliate link: MomOf6 earns a commission if you purchase, at no additional cost to you. , and it includes weekly prayer and praise sections, and uplifting spiritual quotes. 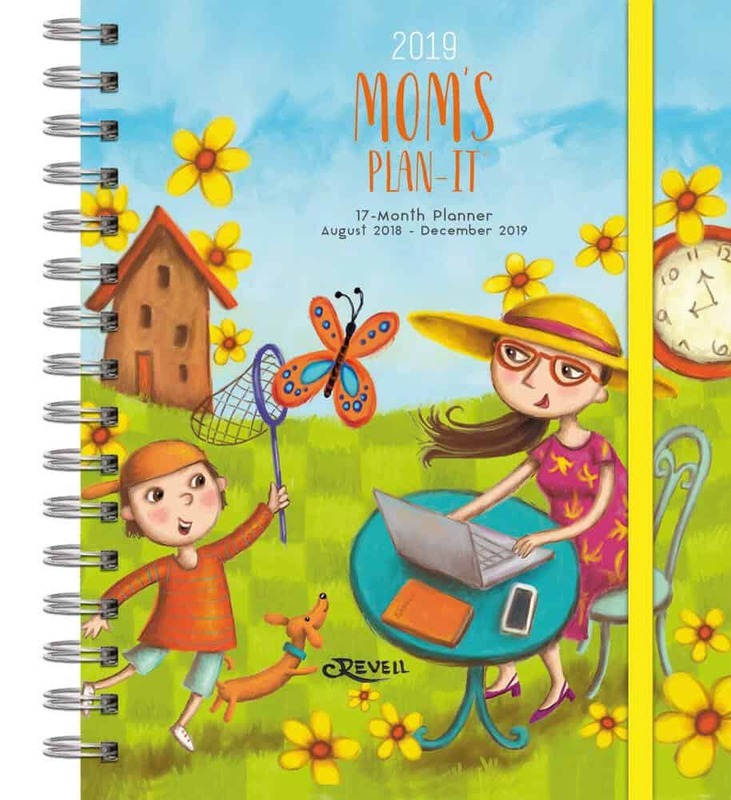 Mom's Plan It Calendar The Mom's Plan-It calendar is like your traditional business planner with both monthly and weekly calendar pages- but it is jazzed up with illustrations and stickers geared towards your family life! I also like that it comes with a storage pocket- a good place to stash receipts while you are on the go! Katie Daisy Paper Calendar This beautifully designed calendar from the creator of "How to be a Wildflower" features monthly and weekly layouts, a large pocket for storing paperwork, and an elastic band closure to keep it all contained. Amy Knapp's Family Organizer This is an affiliate link: MomOf6 earns a commission if you purchase, at no additional cost to you. 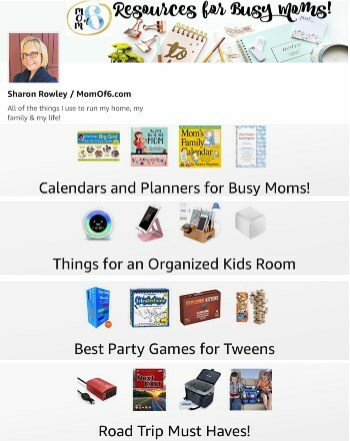 Mom's Plan It Calendar This is an affiliate link: MomOf6 earns a commission if you purchase, at no additional cost to you. 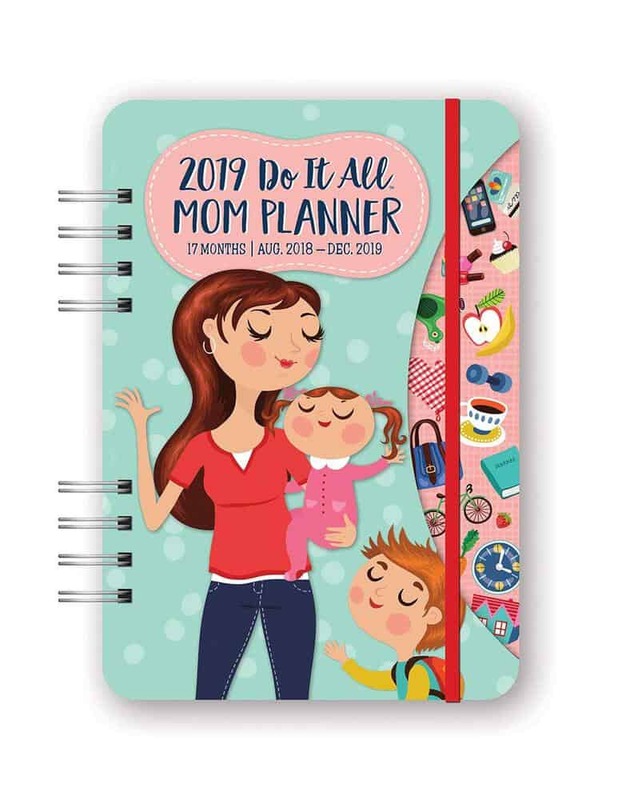 Do It All Moms Calendar This is an affiliate link: MomOf6 earns a commission if you purchase, at no additional cost to you. 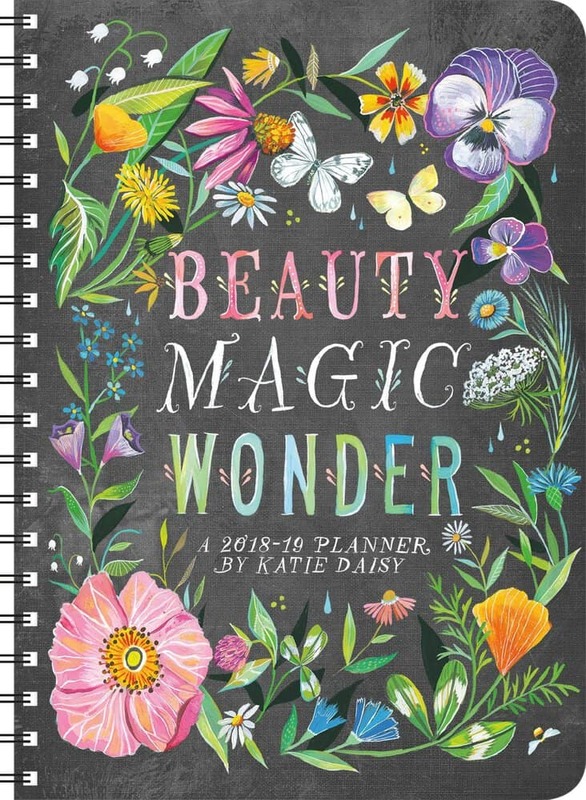 Katie Daisy Desk Calendar This is an affiliate link: MomOf6 earns a commission if you purchase, at no additional cost to you. Size when closed 6"x8" 8.5"x9.5" 8.2"x5.8" 5"x7"
Looking for some more tools to help you be a more organized Mom? it is a useful article. I bookmarked it . after this I have actual facts which will help me to explain my point of view! my mother and father and after this I have actual facts which will help me to explain my point of view! We are a shared calendar that helps you stay organized with not just your family, but your entire network. Our platform offers sharing capabilities that make sure your privacy is taken care. You decide who sees what. We also have a shared list. We are in the AppStore and GooglePlay. We are free with no pop up ads. Thanks for the info! I downloaded Cozi and love it. It will be a huge help! You are so welcome! They make an amazing product! Amazing blog! This is the best app for me. I can check my schedule using iCal. I can put my daily schedule and event without forgetting anything. This is perfect method of getting schedule using your smartphone. If I miss something on events in a day it automatically reminds me. Thank you for posting this valuable blog. Amazing post with great Research, Love your site Thank you. Searching for a family calendar that will also print a monthly copy. Does cozi do that? I believe that it does- but the one I use the most and love both the monthly print out as well as the weekly “list” print out is the iCal system. I hope you can help me. This summer will be the third and last summer that we share a house in NC. I need a schedule for the kitchen. Cooking breakfast lunch and dinner. It seems that we all want to stay a bit later at the beach or pool but we all end up in the kitchen at the same time helping out. That’s nice but each family should be able to relax without feeling guilty. I’ve been using this calendar from calendarsandchores on the easy store for several years now and have never looked back. Hands down best calendar ever! Super attractive and nice heave quality. I keep it in my kitchen where all the family members can see it. Electronic calendars are nice, but there’s nothing like something that is physically present and right in front of the whole family. Every member gets a different color and is responsible for keeping their own items up to date. It’s been a great tool to use train my teenage children about scheduling and time management. The real genius is the rotating weeks that are detached from each other. Thanks for the update Helene! I removed the links- PlumLife is no longer available. Great ideas….I am curious about finding an online calendar that works with families that are d invoiced. This way the two homes can both have their children’s schedule and both add to it. They however cant see each others personal schedule. Would love any suggestions to help manage two schedules for two homes!!!!! Great question. In either Google calendar or iCal, you can set up specific calendars- so you can add one and call it “Kids Schedule”. You can then share that calendar with your ex, and allow him to contribute to it as well, and it can sync back to your calendar. When you go to add personal items to Google Calendar or iCal, be sure you are adding them to the “Personal Calendar” section and not to the “Kids Schedule” section. As long as your Personal Calendar is kept private and it not set to sync, your ex will not see anything on that calendar. My husband and I use calendars in this manner- I share our family calendar with him, but keep my blogging calendar separate. We are a Mac /Apple family all the way around BUT i found that Cozi is much more appealing to me than iCal after many years of iCal. Cozi does allow syncing across all platforms including my boys’ phones/ ipods, and you can have a shortcut in your Bookmark Bar at the top of the browser screen. I also like still use a wall calendar, which makes one extra thing I have to do to keep it updated as well, but still can’t cut that cord 😉 Maybe I’ll start to print out the Cozi calendar every week but until then I use the Flylady Calendar for the kitchen wall. Thanks so much for your comments on Cozi! I love to hear what works for other families! These are great, Thanks Sharon! I’d also like to suggest print-a-calendar.com. It’s great if you like printed calendars because you don’t have to download anything, you can print it right from your browser. And it gives you the best of both words because you can still enter your notes into the date boxes on the computer before you print it. I have been trying to love Cozi since Aug. However, I cannot believe how slow the server is. I can’t update or catchup on things that I’ve finished because I have to “retry” on almost every entry. I’ve contacted support and they are very nice but the problem is making me find something else. I’m so frustrated wasting time trying to enter. Also, you can’t search any text. The list’s don’t have a date option or order of importance…… i wanted to love it, I’m obsessed w/calendars & organization but I’m moving on. Thanks for the input Lisa- I hadn’t heard that about Cozi, but a system that frustrates you is certainly not one worth keeping! 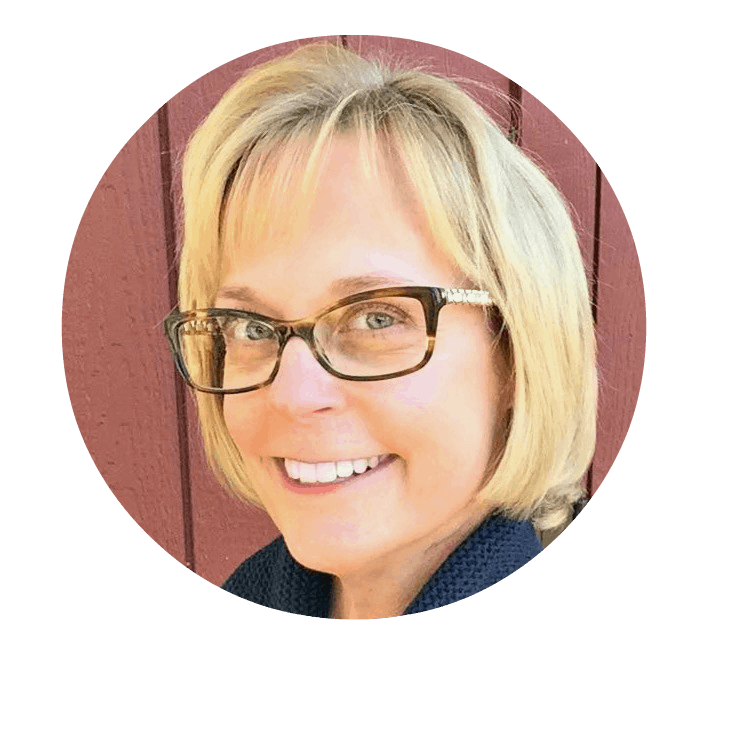 Sharon – If you find a really good grocery list program let me know. I started using the Cozi one and was excited about how you can make many different lists (for the 4 different stores we go to). However, it does not organize the items into sections, ie; fruits, vegetables, dairy, etc. It is just one big list down the left side of the paper and what a waste of trees to print that out! Anyhoo, love your site and your research and suggestions. You are my hero for being so organized with 6 kids! Wow! Aww… thanks Karen! I really like using my Excel spreadsheet list that I created and organized by areas of the store…. and I just keep it on a clipboard in my kitchen and add to it as we run out of things. So far I have not found any program or app that I like better than this method. We’ve been using ourgroceries.com for over a year and love it. Admittedly I run a small home based business, so I mix family with business on my calendar. I found free print sheets (I shall remain nameless unless given permission) that I printed for several months. I grabbed a three ring binder and some dividers. I have my calendar in the very front, with business behind. HOWEVER, it could be modified for any home. Place the calendar in front, absentee notes next, late notes third, to do list forth, etc. Having six kids, I preprinted absentee/late notes that have their names and general reasons. All I have to do is write the date, circle the name, circle the reason, sign my name. It saves time and believe it or not it is awesome, not lazy *L*. I started doing this five years ago when I had a foreign exchange student living here as well. I do the same thing with early dismissal notes – I pre filled them out and then copied them so all I had to do is to fill in the last of the details. Every little bit helps! Thanks so much for including PlumLife in your overview of family calenders. I hope your readers will come give it a try. It’s FREE, easy to get started and simple to use. PlumLife is different than all of the others in a couple of key ways. We understand that keeping separate calendars for each family member is great, but most families have lots of events which include multiple members. So, PlumLife allows a single event to be displayed on multiple calendars and only requires that you enter the data one time. The other way that we are very different is that without leaving the calendar, you can communicate with everyone who needs to know something about the event whether they are family members or not. We are VERY interested in our customer’s suggestions and are continuously making modifications in response. So, I hope your readers who are seeking a solution for their busy families will give it a try and let us know their thoughts. Great post Sharon. There is definitely a method of calendaring for everyone. We’d love for you to check out our site – it launched in 2011 (android app is out and iPhone app will be out next month). We offer a family calendar that is shareable not only with just your family account, but also with other members on different levels of sharing. So, you can opt to let grandparents or aunts and uncles see the kids sports events. Or you can give an au pair viewing rights to your calendar until they go back home. We built our site as a family management dashboard so that there is a lot more than just the calendar. But we’d love for you to check it out – and like the other online calendars here – it’s Free! Thanks for telling me about this Kirsten! I will definitely check it out! A few people have contacted me about family calendar system that either they have helped to create or that they feel strongly about. I can’t wait to research them all, and then perhaps expand my top 6 list to a top 10 list! This comment was from 2012 (I update this calendar post every year to reflect the latest calendars available)…. and the site (http://www.hatchedit.com) is no longer relevant. We use iCal here and I love it! Hubby is a music composer/teacher so we’ve got all macs. It’s so nice to be able to keep our own calendars but see what is happening on the others’! It’s so nice to get a high-five from a fellow iCal fan! Thanks Tricia!